Rehabilitation services are a system for guiding and supporting those who have fallen into crime or delinquency, in rehabilitating themselves to be sound members of normal society. Today, the system has rehabilitation service contents that are wide-ranging and diverse, consisting of (1)examinations and decisions on parole, etc. , (2)implementation of supervision for probationers and parolees, (3)urgent aftercare of discharged offenders (urgent aftercare of persons who have been freed from physical constraint under criminal procedures), (4)work related to amnesties, and (5)support for crime prevention activities in the community. Fig. 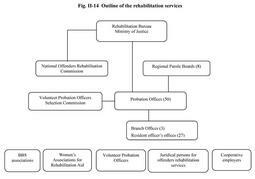 II-14 shows the outline of the rehabilitation services.